Prof Stephen Hawking is to unveil a remarkable £1 million clock with no hands that pays tribute to the world's greatest clockmaker. One clock made by the legendary John Harrison, the pioneer of longitude, took 36 years to build and he was still calibrating it when he died at his home in London on March 24, 1776, his 83rd birthday. The Corpus Clock has been invented and designed by Dr John Taylor for Corpus Christi College Cambridge for the exterior of the college's new library building. It will be unveiled on 19 September by Prof Stephen Hawking, cosmologist and author of the global bestseller, A Brief History of Time. Dr Taylor, an inventor and horologist who studied at the College in the 1950s has put £1 million of his own money and five years into the project. "One of my heroes is John Harrison," he says. Of Harrison's many innovations, he came up with the 'grasshopper escapement', explained Dr Taylor, referring to the device used by Harrison to turn rotational motion into a pendulum motion for timekeeping. "No one knows how a grasshopper escapement works, so I decided to turn the clock inside out and, instead of making the escape wheel 35 mm across and hidden in the case, it is 1.5 m across and visible with the grasshopper escapement around the outside," said Dr Taylor. He calls the new version of the escapement a 'Chronophage' (time-eater) - "a fearsome beast which drives the clock, literally "eating away time". 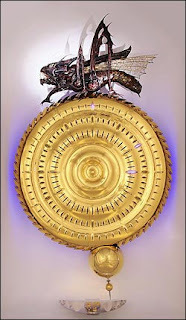 It is the largest Grasshopper escapement of any clock in the world. The Chronophage "hypnotises the watcher with its perpetual motion, punctuated by an extraordinary repertoire of slow blinks, jaw-snaps and stings from its tail," says Dr Taylor. The Corpus Clock, a true mechanical mechanism, which is wound up by an electric motor, has no hands. "It is a new way to show time, with light," said Dr Taylor. The clock has no digital numbers, either, but instead a series of slits cut into the face, each a tenth of a degree across. Blue LED lights are arranged behind the slits, and 60 quarter inch lenses, so that when the escape wheel moves, a series of rapidly darting lights runs in concentric circles to mark passing seconds, and pause at the correct hour and minute. What appears to be lights flashing in sequence are actually controlled mechanically, using the same principle as a zoetrope, the old fashioned way to view a moving image through slits. The total wattage used by the clock is less than that of three 60 watt bulbs. Its massive round face, nearly five feet in diameter, was engineered from a single sheet of stainless steel, the mouldings - like a series of waves rippling outwards - were blasted into place by precisely-controlled explosions under water. On the hour, a chain drops into a wooden coffin hidden behind the clock "to remind us of our mortality," he said. The clock also plays tricks on the observer, seeming occasionally to pause, run unevenly and even go backwards. All this is achieved through mechanics rather than computer programming. Harrison used his clocks as time standards for the marine chronometers he had pioneered to deliver accuracy great enough to allow the determination of longitude at sea. There have been few significant advances in the mechanical clock since Harrison went against the grain of contemporary thinking by using large pendulum swings, enlarging the pendulum's "dominion" to reduce errors. Among Harrison's many remarkable innovations was the gridiron mechanism, consisting of alternating brass and iron rods assembled so that expansion and contraction rates cancelled each other out as the chronometer moved from the tropics to colder climes. He was also the inventor of the first caged roller bearing, the father of the ball bearing, in his last clock. Over 100 ball bearings are used in the Corpus clock.